It was forty years ago, June 1946, when Toshiro Mifune first encountered Akira Kurosawa, and he gradually became Kurosawa's greatest star in 15 Japanese classic films, including Rashomon, The Seven Samurai, Yojimbo, and High and Low. But Mifune, born in 1920, was trained by his father to be a still cameraman, and he says today: "That was why my life was spared in the War. I was with the air force in Manchuria, but my job was teaching aerial photography. I wasn't an infantryman. I worked in an air control tower." While in the military, Mifune met a movie cameraman who worked for Japan's renowned Toho Studios. "After the War," Mifune says, "I looked up my friend and asked if I could be a cameraman too. That's how I got to Toho. But Toho was on strike for most of three years, and lots of the acting stars went elsewhere. My friends submitted my resume and my photograph [for acting], unbeknownst to me." He was granted an audition as part of the June 1946 New Faces talent search. There, Mifune met Kurosawa. Destiny! We are talking at the Montreal International Film Festival. Throughout our interview, Mifune, 65, is as excited as a hyperactive juvenile, jumping up from his seat, racing around his Montreal hotel room to punctuate his anecdotes, breaking into imaginary swordfights and samurai battles, and in general tiring out his poor Japanese-to-English translator, who simply can't keep up with him. This awesome energy is Mifune's trademark. As Kurosawa wrote in his 1982 memoir, Something Like an Autobiography. "It was, above all, the speed with which he [Mifune] expressed himself that was astounding. The ordinary Japanese actor might need ten feet of film to get across an impression; Mifune needed three feet..."
As if he had never told the story before, Mifune jubilantly recounts the day of his discovery. He grabs a straight-backed chair and plays himself at the age of 25, right out of the military, sitting gruffly before Toho judges. "One judge asked me to laugh," Mifune recalls, "I said, 'Why should I laugh? Nothing is funny.' Another judge said, "Get angry.' I answered, 'Why should I get angry?' I got so disgusted that, instead of being proper, I acted bored. They said, 'Get out.'" Fortunately for the future of international cinema, an actress named Takamine Hideka had observed the audition. During the lunch break, she raced elsewhere at Toho to Kurosawa and told the director about this fantastic unformed actor she had observed. Kurosawa sat in on the afternoon part of the audition. "They asked me the same dumb questions," Mifune says, "so I let it all out at them, every foul word. 'Goddamn SOBs!'" The judges were more put off, but Kurosawa was transfixed. As he said in his autobiography, " A young man was reeling around the room in a violent frenzy.... I found this young man strangely attractive." Kurosawa attended the jury meeting afterward, and he lobbied mightily for Mifune. Several judges switched their negative votes: Mifune squeezed through to be hired as a Toho actor. He played a violent bak robber in Senkichi Taniguchi's To the End of the Silver Mountains, a gangster boss in Kajiro Yamomoto's New Age of Fools, and finally, in 1948, a memorably rendered racketeer in Drunken Angel for Kurosawa. It was with Rashomon in 1951, the first Japanese film to make an impact in the West, that both Kurosawa and Mifune became globally recognized. Rashomon won the Golden Lion at the Venice Film Festival, and also an Academy Award for Best Foreign Film. Mifune became associated forever with his period role as the swaggering macho bandit. "Rashomon was a failure in Japan," Mifune says. "We had no idea that it had been submitted to Venice. Kurosawa didn't go to the festival, neither did I. And hardly anyone [at home] knew it won the grand prize. There was a small article in a Japanese newspaper, that was all." In 1952, Mifune performed for another cinema master, Kenzi Mizoguchi, considered my many modern film critics to be the greatest Japanese director of all. For The Life of Oharu, Mifune remembers Mizoguchi saying the first day, "Mr. Mifune, you have done films with Kurosawa for years. There is nothing I can instruct you. Do what you think is right." Mizoguchi died in 1954, but Mifune remembers him well, and offers a rare glimpse of Mizoguchi on the set. 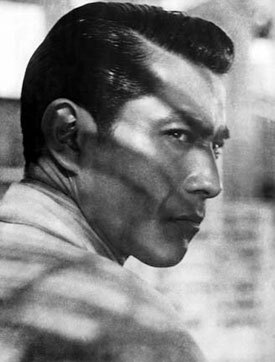 "He was a rather complex person and a perfectionist," Mifune says. "A scene with a famous actress wasn't going so well, so Mizoguchi dismissed everyone for the day so they could quietly talk. He was a stickler for props. If an object was to be used in the movie for tea time, he might look at it and say, 'This is a reproduction!' He would close down the set and order the prop man, 'Get the original in Kyoto.'" For the benefit of the interviewer, Mifune improvises an extraordinary, once-in-a-lifetime Mizoguchi imitation. He lowers eyeglasses to pinch his nose and squats to examine an imaginary prop, grumbling in Japanese that the prop isn't right! "Mizoguchi was an artist, a professional," Mifune says with respect, standing upright. Did Mifune and Kurosawa ever quarrel on the set? "Yes, on Yojimbo," he admits. "One day Kurosawa said, 'I won't mention names, but the actors are late.' I said. 'What are you talking about? I'm the actor.' Every day after that, when Kurosawa arrived, I would be there already, in costume and makeup from 6 a.m. I showed him." A quarter century later, Mifune still smarts from this insult to his dignity. "No matter how much I drank the night before," Mifune says, "I never once was late on his films. But with Kurosawa, sometimes people are waiting, and he never shows up. The people go to his house, and he says, 'I'm sorry. I don't feel well today.'" What is the secret of Mifune's well-being? He chortles. "I still ride horses and do a lot of laughing. But I was born this way. I can't help it. When I was young, I played old men's roles. But now I'm a little boy!"